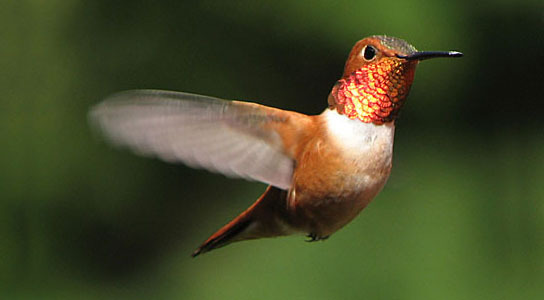 A new study suggests that hummingbirds are more interested in the location of the flower than the actual color of it. The published research states that while presenting the hummingbirds with artificial flowers as a food source, observations confirmed that color made no difference in their selection process. Hummingbirds pay no attention to what color a flower is when figuring out whether to raid it for nectar, the latest research suggests. The researchers who led the study say it’s not that the birds don’t see the color of different flowers – just like us, they can see in color throughout the visible spectrum. But location is a much more reliable source of information and overshadows any information provided by color. ‘Although this goes against what you might expect – after all flowers must be colored for a reason – our finding makes perfect sense,’ says Dr Sue Healy from the University of St Andrews, co-author of the study. ‘Their color vision is better than ours, so you might expect them to focus on it,’ says Healy. ‘Ultimately, this suggests they ignore color and just focus on location,’ explains Healy. ‘I guess it’s a bit like us in the supermarket. We know exactly where to look on the shelves and isles for our favorite products, which means that when the supermarkets move them, we have to really search to find them again,’ explains Healy. Different flowers vary in how much nectar they contain. This is true not just between species, but also on the same plant. ‘So relying on color to guide them isn’t necessarily going to be the most successful strategy to get food,’ she adds. Be the first to comment on "Hummingbirds Notice Location, Not Flower Color"